This geologic map is the result of a cooperative effort of the U.S. Geological Survey and the National Park Service in collaboration with the Navajo Nation and the Hopi Tribe to provide regional geologic information for resource management officials of the National Park Service, U.S. Forest Service, Navajo Indian Reservation (herein the Navajo Nation), the Hopi Tribe, and for visitor information services at Grand Canyon National Park, Arizona as well as private enterprises that have lands within the area. The Cameron 30’ x 60’ quadrangle encompasses approximately 5,018 km2 (1,960 mi2) within Coconino County, northern Arizona and is bounded by longitude 111° to 112° W., and latitude 35°30' to 36° N. The map area is within the southern Colorado Plateaus geologic province (herein Colorado Plateau). The map area is locally subdivided into six physiographic areas: the Grand Canyon (including the Little Colorado River Gorge), Coconino Plateau, Marble Plateau, Little Colorado River Valley, Moenkopi Plateau, and the San Francisco Volcanic Field as defined by Billingsley and others, 1997. Elevations range from about 2,274 m (7,460 ft) at the south rim of Grand Canyon along State Highway 64 to about 994 m (3,260 ft) in the Grand Canyon, northeast quarter of the map area. 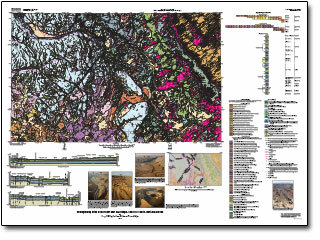 Billingsley, G.H., Priest, S.S., and Felger, T.J., 2007, Geologic map of the Cameron 30' x 60' quadrangle, Coconino County, northern Arizona: U.S. Geological Survey Scientific Investigations Map 2977, scale 1;100,000, https://pubs.usgs.gov/sim/2007/2977/.